Share form docs from authors to multiple iDevices. Is there a better alternative to FormEntry Server? Is FormEntry Server really the best app in Applications category? Will FormEntry Server work good on macOS 10.13.4? 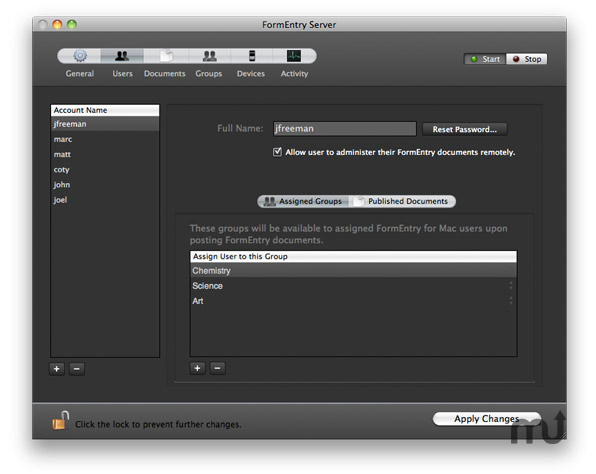 FormEntry Server is a smart and effective way to share form docs from authors to multiple iPads, iPhones, and iPod touches. FormEntry Server comes with all the built-in features you need from an easy-to-use Bonjour Wi-Fi server, all working with an unlimited number of FormEntry authors and an unlimited number of iPads, iPhones, and iPod touches. Distribution made easy. FormEntry Server needs a review. Be the first to review this app and get the discussion started! FormEntry Server needs a rating. Be the first to rate this app and get the discussion started!